Before Evans was even born I pretty much knew that I was going to have to try very hard to control my urge to shop for him. I have heard lots of mother's state that it is so much more fun to shop for little girls clothing and I have to (strongly) disagree on this point. What can possibly be more fun than little boy clothes? It's so easy to make them look nice and clothes can actually be worn over and over without repeating outfits! I know, maybe I'm a little crazy but A. I'm from Atlanta where well dressed children are the norm, not the exception and B. buying my child cute clothes does not involve me having to try on clothes resulting in me feeling fat. So there you go, my reasons for my son's great wardrobe. Each winter (all two of them that Evans has experienced) I like to stock up on long sleeve appliqued t'shirts for playtime. These shirts are so easy to wash and since they are just t'shirts, who really cares if they get dirty. Plus, it goes without saying that a kid should have a shirt for every holiday, right? In the past a good friend of mine has done Evans' shirts for me but this year her schedule was too hectic and I was pointed in the direction of a sorority sister of mine, from Ole Miss, JoBeth Williams and her company Southern Loop (I know, does it get anymore Southern than my connections to JoBeth?). I can't even express how pleasant it was to work with her on Evans' winter/holiday shirts. And really, do they get any cuter than these? Evans practically spazzes out to wear his "choo choo" and "toorkey" shirts each day. And the tractor shirt on top was a gift for our across the shirt German neighbors who actually own the "dactor" that Evans talks about daily. The "apple choo choo" above is actually navy blue even though it looks black. 5 pairs of khakis and 5 pairs of different color cords to pair with these and we are ready for winter (well, as long as we don't have to actually go outside into the German winter). There are so many different designs to choose from and if JoBeth doesn't have exactly what you are looking for, she will find it. Plus, once you look at her website, you won't be able to resist all the other cute things too. Sometimes I really wish I had a shred of creativity but thankfully God made people like JoBeth to fill that roll! Can't wait to get our next order up! With E's initials of course. Now if only Evans would stand still long enough for me to get some better pictures taken of him while he sports his new duds. I'm not having a ton of luck! Does anyone else ever find themselves bored with a couple minutes to spare (I know, yeah right) so you find yourself scrolling back through old iPhone pictures? Considering we have about 23 old iPhones lying around the house I sometimes find myself picking them up and going through the pictures that are on them. It's even funnier when you come across a REALLY old cell phone, like the very first ones to take pictures and find shots of yourself posing with Johnny Fairplay in a bar in Danville, Virginia. But that is neither here nor there, right? Anyways, I tend to scroll thru my current phone every once in awhile and lately I have been in for a couple of treats. Last week I came across this shot and stopped for a minute to think to myself "oh that was dumb, I guess I took a picture of the ground". Only to find this as the next shot. It looks like a stuffed animal massacre has taken place. This is just an example of roughly 80 something pictures taken in a row before I finally arrived at a shot of the culprit. Ah-ha! Remember those pajamas from the Halloween class party? Busted. Perhaps I should show him how to operate the forward facing camera (or is it called rear facing camera, I can never decide) so he can get some shots of himself doing things that are cute. Two weeks ago I found a series of no less than 50 shots of the comforter on Deaner and I's bed. I guess I should take better care of my electronics or one of these days there is no telling what kind of picture will be posted where! 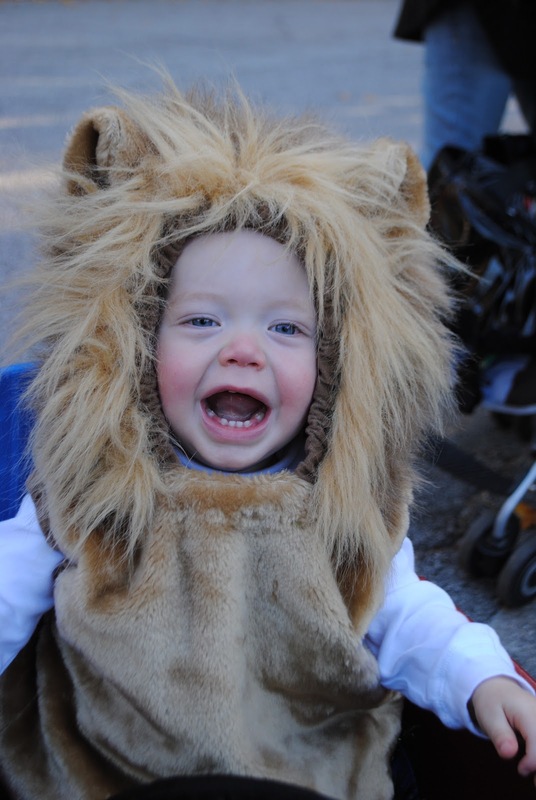 I really didn't think that I could ever come up with a costume as cute as Evans' 2011 lion hit but I knew I was going to try. Looking at this picture always makes me smile so I was pumped to start looking for something great in 2012. When I saw the costumes for this year I knew immediately that Evans was going to have a partner in dressing up. So, lets be honest. This might be a great picture of E last year and it might APPEAR that he had an awesome time dressing up and trick or treating but that simply wasn't the case (the whole time). We had several issues last year when it came to the costume, when it came to riding in the wagon and when it came to getting his picture taken. I wouldn't say that he loved Halloween but we made it and I got a great Christmas card out of it. In fairness, it was getting a little bit late by the time Buddy got home to have his picture taken with our little lion. I shouldn't have been surprised last year considering this was about how the first year went too. And even helped Mama and Dada carve pumpkins into Jack-o-lanterns though I am pretty sure his favorite part of the carving was to exclaim "eeewww GROSS" when we cut the lids off and he could see pumpkin guts. "Ewww gross" is now a much used phrase around our house. Sorry that is a crappy picture but it came from Deaner's iphone and it was dark. Halloween happened to fall on a school day for us this year and Evans got to celebrate in style by wearing his pajamas to school. The parents got to join in later in the morning for a Halloween party and all I have to say is that those teachers are better people than I am. That classroom is chaos. After a nice long afternoon nap it was finally time for the moment I had been waiting for. 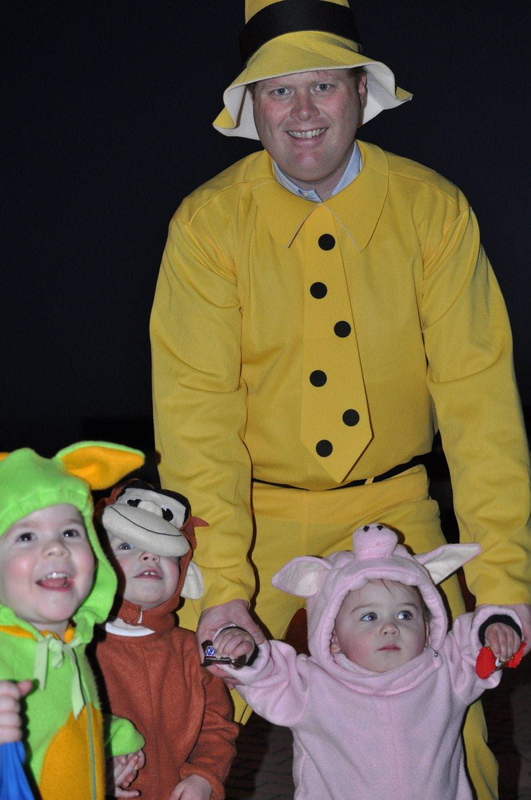 As I got the Curious George monkey costume out of the laundry room I got the reaction that I had pretty much been expecting. Screams and a fit of terror. So I did what any good mother would do and I held him down while I wrestled him into it. 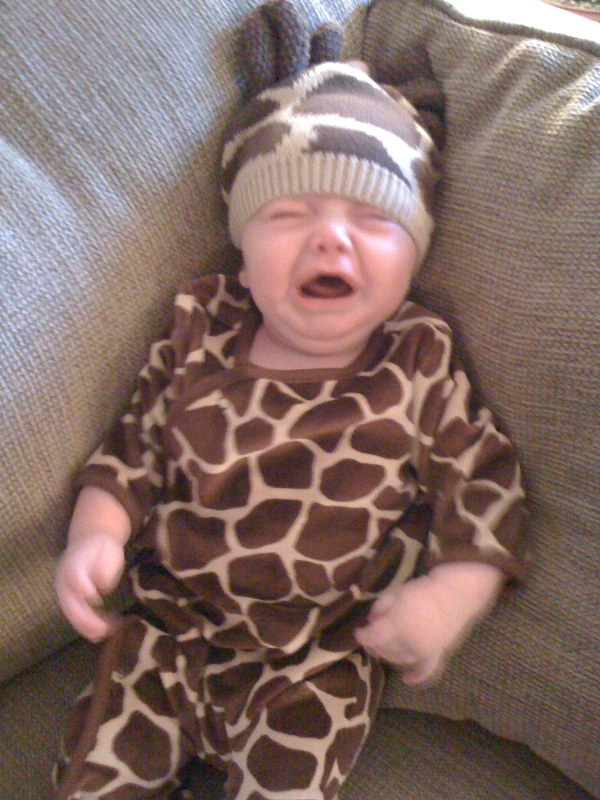 Once in the costume, it didn't seem as bad to him. Just as long as the monkey hat wasn't anywhere in his direct sight. We decided to take Evans to the US base to trick or treat just because we know that everyone participates and we wouldn't get any funny stares while ringing door bells. That, and the german phrase for "trick of treat" is like three sentences long and sounds more like a threat than a friendly request for candy. Once we got to the base we met up with Evans' counterpart. Dun da na nuuuuunnnn!!!! The Man With The Yellow Hat!! I have to admit that I jacked this idea from someone else's Facebook page but I couldn't help it. People keep telling me over and over that Deaner is such a great sport and they can't believe he wore that costume but I'm not lying when I say that he loved it and he was actually the one requesting it back in February. As expected, George was not fond of his hat......at first. He got over it quickly and ended up loving his costume. I have to say that it was really enough for me just to see Evans in his costume. I had zero expectations for him actually trick or treating. I thought in the very least he could run around and get some exercise and play with his friends but I was surprised again. George took his trick or treating rather seriously and actually held The Man With The Yellow Hat's hand, held his own candy bag, went up to houses and said "trick or treat" and even "thank you". I was highly impressed and Deaner and I were both so happy that he enjoyed himself (because we did too!) At one house the lady handing out candy took one look at Deaner and asked if he would hold her baby to pose for a picture. Here is TMWTYH with all the kids we went out with. I'd say it is pretty clear that everyone (including the 35 year old man) had a great time. Now I just have to start thinking about 2013 as I'm sure Deaner will demand to be in on the fun again! The best part about Halloween in our house? Every time I ask Evans if he wants a piece of his candy he violently shakes his head no and Deaner doesn't like candy. What kind of people am I living with here? More for me! We are in the home stretch now to our Atlanta Christmas Vacation 2012! Sometimes even I have to wonder what I have been up to when I go over two weeks without posting updates. Things certainly don't seem to slow down around here but once I get behind, it's hard to find the motivation to catch up. Since I know we will up late tonight watching the Election results I figure that today is as good as any for backing up a couple weeks. I'd say that the weather here in Germany is officially turning to winter. While we actually had some sunshine and warmer temps today (45 degrees and yes, that's warm) we have had a couple weeks of rain, fog, gloom and colder weather. I actually saw snowflakes with my own two eyes two weekends ago. Right up until that point we took advantage of every sunny afternoon we could at our town wine stand. Deaner actually claims that he knew for sure we would buy this house in Germany the very first time the German sellers took us to the wine stand to show us around. I don't claim anything as ridiculous but we have certainly had our fair share of fun down by the Rhein. It is the perfect place to come when Deaner gets off work in the afternoons (before daylight savings ended) to let Evans burn off some energy. We haven't had a ton of opportunity to take "new bike" out for a spin (it is currently sitting in my kitchen) but we did get one shot and all I can say is, thank god the grown-ups control the steering. And of course once we reach the river, the bike gets ditched immediately in favor of wide open spaces. The wine stand could only be improved if it were to be completely fenced in. I know I know, aesthetics and all, but I'd be able to relax a little bit more! A couple of those pictures were taken with Instagram, which is new to me. I have to say that I am really enjoying it but the problem is that I forget to open it instead of my regular old iphone camera. And I don't like how you have to save each picture etc before you can take a new one. I am one of those people that need to be able to take 39847 pictures in a row and then weed out the good ones. School is going really well for Evans and we couldn't be happier to have gotten into this particular program. He has had one more "hit incident" in which he was hit in the face with a different plastic animal (not the horse like last time) but it didn't slow him down. No more crying in the mornings at drop off. Now I get a kiss and he is off to the races. Here is his latest piece of artwork that came home last week. I was at the same loss that most of you probably are right now. All I know for sure is that I need to get it out of my car because it has dried up and it getting bits of dirt and stick all over my middle console. I'm not sure if this or the all black painted pumpkin wins the prize for most original. I guess you have to work with what you are given. The past two Thursdays I've been taking Evans to story hour at the library on base where someone reads to the kids and then they do a craft. Our first visit was successful though Evans was not as interested in listening to the story as he was in reading the book about Choo Choo's he somehow found on the shelves. Unfortunately our last trip to story hour turned out to be more like story 8.5 minutes. I don't know what got into Evans but all he wanted to do was run around the bookshelves and scream while the story was going on. I tolerated this for about 5 minutes before he decided to escape into the main library and cause a commotion. We were forced to leave early and there was NO DVD watching on the way home as punishment. Now I'll be nervous to go back. Something about quiet places makes Evans go berserk while being in chaotic places makes him behave perfectly. A little backwards if you ask me. So that is just a brief overview of what has been going on here lately. Tomorrow I will put up all our Halloween Trick or Treating pictures and share some more of our fall adventures. For now, I have to go start dinner and prepare for my husband watching Election stuff all night. Happy Tuesday!